Throughout the year, package thefts occur on a fairly regular basis. 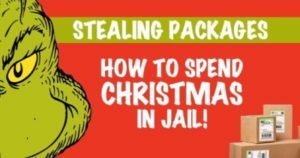 But, as Christmas draws near and package delivery increases, so too do the thefts. While packages left on doorsteps and out in the open may seem to be easy targets for thieves, the consequences of getting caught are rarely considered. Would-be porch pirates should certainly think through their intended capers as many houses are equipped with doorbell cameras these days that capture clear video of any movement at or near the doorway. What Can Happen to Individuals Who Steal Packages? 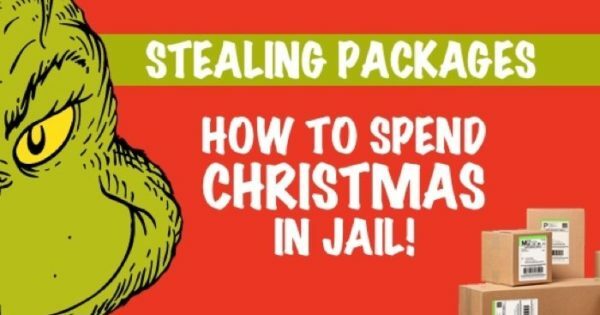 Grinchy thieves can face stiff penalties for stealing packages. In Texas, theft is classified by the amount of property that is stolen. 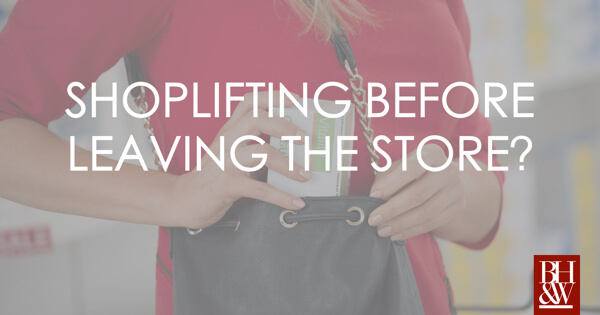 Depending on the amount of the items stolen, a person caught stealing packages can face anywhere from a Class C misdemeanor punishable by a fine of up to $500 up to a First Degree Felony facing 99 years or life in the penitentiary. The latter would require someone stealing an item worth more than $300,000. While this may be unlikely, a thief wouldn’t know what he or she is stealing until he opens up that box. In addition, if committed within the same criminal episode, the aggregate amount of the items stolen could increase the punishment ranges for the offense as well. What Happens When Multiple Individuals Act as a Team to Steal Packages? The consequences of people acting in a team to steal packages can increase the acts to the offense of Engaging in Organized Criminal Activity. 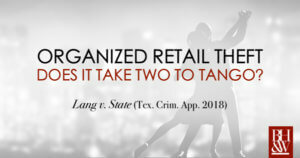 In Texas, a person commits the offense of Engaging in Organized Criminal Activity if with the intent to establish, maintain, or participate in a combination or in the profits of a combination or as a member of a criminal street gang, the person commits or conspires to commit theft. Tex. Penal Code 71.02. This increases the punishment one category higher than the offense originally committed. Most often, these types of cases are filed as 3rd degree felonies which carry a range of punishment of between 2-10 years in prison and up to a $10,000 fine. Punishments for package theft can be harsh. 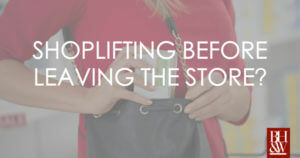 While a person may be stealing property worth only a few dollars, they may also be stealing property worth thousands. The potential punishment a person faces for package theft may not deter thieves but there are certain other things that citizens can do to prevent these acts from occurring. The primary means by which package thefts are being prevented are with the increasing use of video surveillance. Individuals looking to steal packages off of front porches are becoming more and more aware of doorbell cameras and other small home surveillance cameras. The increased media coverage of these incidents and the increased capture of thieves by way of theses surveillance methods is enhancing deterrent efforts. Amazon has also begun testing out a service that allows delivery drivers to leave packages inside your home. But for those individuals who persist and ignore the warnings and advice – and reflections from the Grinch – the BHW phone line is always open – just don’t say we never told you so! Is a Video of a Video Admissible in a Criminal Trial? 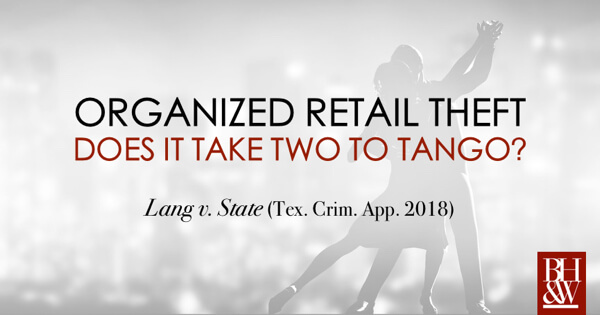 Technology has dramatically changed the landscape of criminal law procedure, and ultimately criminal convictions, in Texas. Updated DNA testing exonerates the wrongly-accused, while incriminating the guilty. Traffic cameras are commonplace on Main Street, clocking speeding motorists who are subject to fines and penalties—and bad feelings. Recently in Arkansas, recordings from Amazon’s Echo artificial intelligence device have been used by prosecutors as evidence in a murder trial. As digital evidence evolves rapidly, so must the evidentiary rules supporting admissibility. In this late-breaking case, the Texas Court of Criminal Appeals considers one man’s conviction for theft and burglary vis a vis the admissibility of “picture only” video footage. Law enforcement was called to the scene of a burglary at a business in Royse City, Texas. Police discovered disarray; cut wires, mangled cables, and bolt cutters were seized as evidence, but no suspects were apprehended. One month later, police were called to investigate the same scene for another burglary. This time, ATV tracks led police to a nearby field where they found a receipt from the local Family Dollar store mere feet away from a stolen ATV. Even more curious were the items listed on the receipt, which included duct tape and utility knives. Police used the date, time stamp, and the address on the receipt to request video footage from inside the store. Employees at Family Dollar provided investigators with time and date-stamped footage that corresponded with the receipt found at the scene of the crime. Police recorded the incriminating footage on their body cameras, as recording from a VHS cassette proved time-consuming and clunky. Although the footage was non-audio “picture only,” it showed a suspect purchasing the items that were reflected on the receipt found at the crime scene. Further, the footage time and date stamps placed the individual inside of Family Dollar at a certain time, on a particular day. Leveraging all of the information learned from the receipts, the fact that the ATV was stolen, and the video footage, law enforcement soon had a suspect—Jamel Fowler. Fowler was convicted of theft of property for stealing the ATV and was sentenced by a jury to two years imprisonment. Fowler appealed. On appeal, the court reversed the trial court’s conviction and sentencing, holding that “trial court committed reversible error by admitting an unauthenticated videotape exhibit into evidence.” The State of Texas appealed to the Court of Criminal Appeals to determine whether prosecutors may prove authenticity of video footage without the testimony of someone who either witnessed what the video depicts or is familiar with the functioning of the recording device. In other words, is the video of a video at Family Dollar admissible as evidence against Fowler? In order to answer that question, the CCA looked to Texas Rule of Evidence 901. 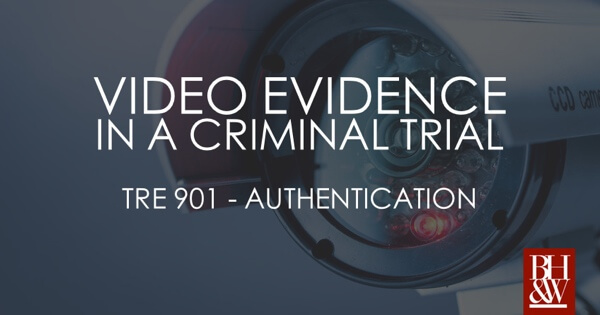 Texas Rule of Evidence 901 governs the authentication requirement for the admissibility of evidence. Typically, to satisfy the requirement of authenticating evidence, the person offering the evidence must produce items or data sufficient to support a finding that the item or data is what the proponent claims it is. TEX. R. EVID. 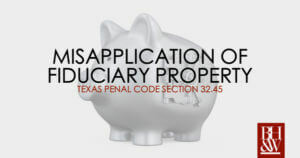 901(b)(4); see Druery v. State, 225 S.W.3d 491, 502 (Tex. Crim. App. 2007). Conclusive proof of authenticity before allowing admission of disputed evidence is not required. May the proponent of a video sufficiently prove its authenticity without the testimony of someone who either witnessed what the video depicts or is familiar with the functioning of the recording device? The Court answers that, yes, it is possible, given the facts. 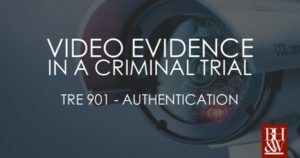 The Court reasoned that video recordings without audio are treated as photographs and are properly authenticated when it can be proven that the images accurately represent the scene in question and are relevant to a disputed issue. Huffman v. State, 746 S.W.2d 212, 222 (Tex. Crim. App. 1988). The Court stated that (1) the officer’s in-person request of the manager of the Family Dollar store to pull the surveillance video on a certain date at a certain time; (2) that the distinctive characteristic that there is a date and time stamp on the videotape; and (3) the fact that the date and time on the videotape correspond to the date and time on the receipt that was found within three feet of the ATV; (4) the fact that the videotape pulled by the manager reveals Fowler at the store on that date at that time purchasing the items listed on the receipt that was found near the stolen ATV, were enough, together, to authenticate the video. The video was sufficiently authenticated to be admissible into evidence. The evidence strongly pointed to Fowler and, accordingly, his conviction was upheld. Evidence obtained by a valid search warrant can be used at trial. But what if the search warrant was based on information provided by a third party who later recants the information he provided? Further, what if law enforcement mischaracterized the evidence when presenting it to the magistrate in the application for the warrant? What legal remedy, if any, exists to support defendants who find themselves in this situation? The Fifth Circuit heard United States v. Minor in August, this article summarizes the Court’s surprising holding. Anthony Minor and his friend Katrina Thomas, a Fannie Mae employee, hatched a plan to steal the identities of numerous Fannie Mae clients with the intention of using the personal information to obtain entry into checking and savings accounts. Thomas created a list of client names and personal information while at work, and then provided Minor with the information. Minor was successful in using the data to steal money from those individuals’ bank accounts by contacting banks, pretending to be the individual, and transferring funds to Minor’s personal account. During the time of these crimes, Minor was frequenting a hotel. Eventually, law enforcement began investigating Minor; the lead investigator assigned to the case was Albert Moore. In a warrant affidavit, Moore states that Will Crain, the director of security at the hotel, reported to law enforcement that he had seen Minor with expensive merchandise. That statement was used to establish probable cause for obtaining a search warrant. Law enforcement used the search warrant to search Minor’s dwellings, and the search rendered evidence of the crimes. Minor was arrested on numerous bank fraud charges. 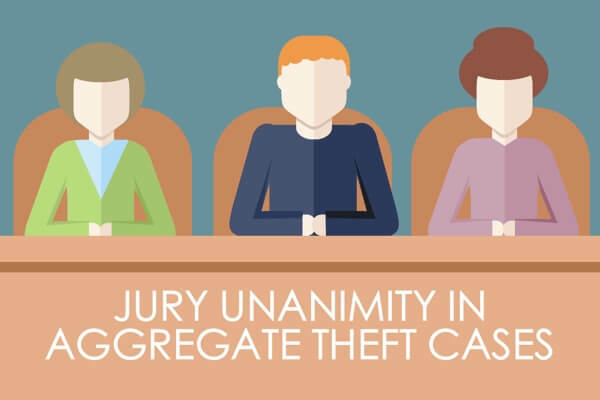 At trial, a jury found Minor guilty of bank fraud, aiding and abetting bank fraud, conspiracy to commit bank fraud, using or trafficking in an unauthorized access device, aggravated identity theft, and aiding and abetting aggravated identity theft. Minor was sentenced to 192 months’ imprisonment, a sentence that incorporated a six-level enhancement, but was set well below the federal Sentencing Guidelines recommendation at the trial judge’s discretion. 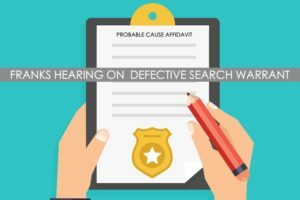 Minor appealed to the Fifth Circuit Court of Appeals, arguing that the search warrant contained false information and that he is entitled to a Franks Hearing to establish the facts surrounding the statements used to support the finding of probable cause for the search warrant. that his sentence should not have included a six-level enhancement (more prison time). Minor alleged that Crain, the hotel’s security guard, testified at trial that he did not see Minor carrying merchandise and therefore, law enforcement did not have probable cause to secure a search warrant. “U.S.S.G. § 2B1.1 (2014), provides that “if the defendant’s offense involved 250 or more victims, then § 2B1.1(b)(2)(C) requires the court to increase the defendant’s offense level by 6 levels. U.S.S.G. §2.B1.1(b)(2)(C). The Fifth Circuit relied heavily on Supreme Court precedent with regard to the evidentiary appeal and deferred to the reasoning of the trial court with regard to sentencing. As “Minor concedes that Agent Moore did not intentionally insert false information into the affidavit, or act with reckless disregard for the truth…and because Minor failed to make the requisite substantial preliminary showing, [Minor] is not entitled to a Franks hearing.” Secondly, “[Minor] asks us to hold that in a case where a law enforcement affiant is relying upon information….from other[s]…the challenger should not be required to meet the intentional or reckless requirement to proceed a Franks hearing.” Here, “Minor’s argument is meritless under any standard…[and he] has not cited any authority recognizing his proposed exception to Franks…we decline…to create a new exception to well-established Supreme Court precedent. Further, the Fifth Circuit said, “we agree with the district court that Minor…actively employed the means of identification of over 250 victims in furtherance of their bank fraud scheme…with the object of unlawfully accessing those customers’ bank accounts without their consent.” Accordingly, the Fifth Circuit affirms the holding and sentence of the trial court. There is a knock at the door. You look out your peep hole and see law enforcement. Do you have to open your door? If you open your door, do you have to let them in? What if they don’t have a warrant, but ask nicely and start talking to you? If you give consent to law enforcement to enter your home, can evidence seized be used against you in court later on? This article is a summary of United States v. Danhach, a case recently decided in the US Court of Appeals for the 5th Circuit. Evidence is Seized After Police Politely Ask If They Can Come Inside. The Houston Police Department and the FBI had been investigating Sameh Danhach and his business associate for possible involvement in organized retail theft. As part of the investigation, law enforcement began surveilling a warehouse that Danhach had been seen entering on multiple occasions and to which a car used in stealing over-the-counter drugs and expensive baby formula had been linked. After several weeks of surveillance, law enforcement approached the warehouse and knocked on the door. Danhach’s business associate permitted the officers to enter, as surveillance cameras rolled capturing the entire conversation. The officers saw trash bags full of merchandise and other indicators of stolen goods out in the open. Citing this evidence in a probable cause affidavit, law enforcement obtained a search warrant and seized the evidence for trial. Danhach was charged with conspiracy to transport stolen goods in interstate commerce and also with aiding and abetting the interstate transportation of stolen OTC medication and baby formula, violations of 18 U.S.C. § 371 and 18 U.S.C. § 2314, among other charges. At trial, the jury found Danhach guilty on all counts and the judge sentenced him to 151 months in prison and a three year term of supervised release. Danhach appealed. The Knock and Talk Procedure, the Plain View Doctrine and Consent Collide. 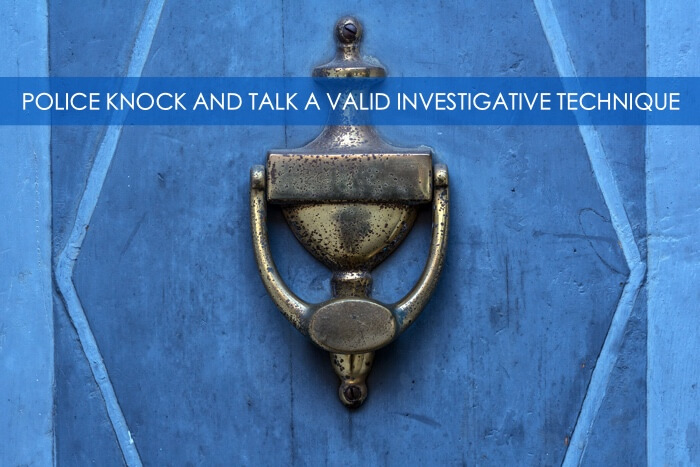 Courts have recognized the “knock and talk” technique as “a reasonable investigative tool when officers seek to gain an occupant’s consent to search or when officers reasonably suspect criminal activity.” United States v. Jones, 239 F.3d 716, 720 (5th Cir. 2001); Kentucky v. King, 563 U.S. 452, 469 (2011). Evidence may be cited in support of a search warrant if (1) law enforcement entered the area where the item was located; (2) the item was in plain view; (3) the incriminating nature of the item was immediately apparent; and (4) law enforcement had a lawful right of access to the item.” United States v. Jackson, 569 F. 3d 236, 242 (5th Cir. 2010). However, if for some reason the “plain view” doctrine does not stand up to the facts of a case, then “consent to enter” may be an alternative argument, but “the government must demonstrate that there was effective consent that was given voluntarily by a party with actual or apparent authority.” United States v. Scroggins, 599 F.3d 433, 440 (5th Cir. 2010). The Big Issue Before the Fifth Circuit was Whether Officers Lawfully Entered and Remained Inside of Danhach’s Warehouse While Conducting a “Knock and Talk” Interview. Here, the Fifth Circuit agreed with the district court and affirmed judgment and sentencing, holding that law enforcement permissibly used the knock and talk technique. The Court pointed out that video surveillance is consistent with law enforcement’s account that consent was obtained before entering. Even after law enforcement entered, Danhach’s business associate gave them permission to walk around the warehouse. The stolen goods were in plain view and were immediately apparent and indicative of criminal activity. Based on this series of events, “even if any evidence cited in the warrant…was not covered by the plain-view doctrine, the record supports the conclusion that the agents asked for and received consent for a full search of the warehouse.” Danhach did not offer any evidence to show that the consent was coerced in any manner, nor did he offer any evidence that the items seized were not in plain view. In sum, law enforcement may ask to enter a premises without a warrant and if consent is obtained from a person who is “in charge” or who looks to be “in charge,” then that consent is sufficient according to the Fifth Circuit, citing previous cases. Once lawfully inside a dwelling or premises, if law enforcement officers see, in plain view, objects that are linked or are seemingly linked to a crime, then those items may be the basis of a warrant to seize the items and to conduct an even more extensive search.